Red-necked Grebes - Barton Cove, Gill, Franklin Co., MA. April 15th, 2019. The impressive run of waterbird fall-outs at Barton Cove, Gill continued unabated this morning when a southerly airflow combined with torrential rain, mist and poor visibility brought no less than 20 grounded Red-necked Grebes. The birds were initially quite mobile rarely settling for long but as the weather improved they found refuge just off Barton Island and started to rest and feed. With them came a Horned Grebe in full summer plumage, 2 Red-breasted Mergansers, as many as 9 Bonaparte's Gulls and a particularly brutish Caspian Tern. Some 15 Northern Rough-winged Swallows were present at the Turner's Falls Rod and Gun club but aside from 7 Lesser Scaup waterbirds were few, and the fall-out appeared to be more or less restricted to Barton Cove this morning though a couple of Red-necked Grebes did drop into the power canal and stayed throughout the afternoon. Today's total of 22 Red-necked Grebes was the single largest arrival that I've recorded in the Gill/Turner's Falls area to date. With a female Red-breasted Merganser leading the flock. Caspian Tern - Barton Cove, Gill, Franklin Co., MA. April 15th, 2019. Bonaparte's Gulls and Caspian Tern - Barton Cove, Gill, Franklin Co., MA. April 15th, 2019. Horned Grebe (left) with Red-necked Grebes - Barton Cove, Gill, Franklin Co., MA. April 15th, 2019. Bonaparte's Gull - Barton Cove, Gill, Franklin Co., MA. April 15th, 2019. Bonaparte's Gulls - Barton Cove, Gill, Franklin Co., MA. April 15th, 2019. MA - waterbirds on the move part three; more Bonaparte's Gulls and Caspian Terns! Caspian Tern - Barton Cove, Gill, Franklin Co., MA. April 14th, 2019. Flying in from the east with Barton Island in the background. The morning of April 10th found me back at Barton Cove hoping to catch up with even just a tiny fraction of the fall-out seen the on the previous evening. Despite squally rain showers and 100% cloud cover, it was fairly obvious a major clearance had taken place overnight....not a single Bonaparte's Gull was present at first light. As if to emphasize the general departure of waterbirds, 3 Red-breasted Mergansers (male and 2 females) lifted off the water, circled the cove and headed off high to the NW. But 6 Ruddy Ducks, 5 Greater Scaup, 2 Horned Grebes and a Pied-billed Grebe ended up staying through the day with a fine pair of Northern Pintail appearing with the Canada Goose flocks in the evening. A Snow Goose and 2 American Wigeon remained, both species being long stayers. Ruddy Duck - male, Barton Cove, Gill, Franklin Co., MA. April 10th, 2019. Northern Harriers (2) - Turner's Falls Airfield, Franklin Co., MA. April 10th, 2019. Two of a minimum of four seen within an hour at the airfield in mid-morning. Clearing skies and a change to quite cold air coming from the north triggered a shift in focus and by mid-morning I was enjoying great views of a male Northern Harrier at Turner's Falls Airfield. Although I soon lost that particular male to view, a further two Northern Harriers dropped into the airfield together just as suddenly as the male had appeared. Both were 'female-like' in plumage but careful scrutiny showed them both to be young males, one of which lingered while with the other one departed fairly quickly to the NE. After 20 minutes or so, a fourth harrier dropped in, this one being a young female which spent a good 15 minutes quartering the rank grasses along the taxi-way. Spring harrier migration isn't a particularly easy event to see in Franklin County so to have four individuals within an hour at the same site was pretty remarkable. Moreover, David Sibley recorded three Northern Harriers (two adult male, one immature male) migrating through Hilltop Farm, Deerfield during the morning hours. In the evening Josh Layfield visited Turner's Falls Airfield finding two Northern Harriers (male, female-type) hunting, possibly lingerers from the morning, but it's equally possible that they were new migrants. Either way, April 10th was something of a stellar day for harrier migration in Franklin County. Bonaparte's Gulls - Barton Cove, Gill, Franklin Co., MA. April 12th, 2019. The 11th was fairly quiet for new waterbird arrivals but the 12th was yet another fine day for Bonaparte's Gulls with the initial discovery of a tight flock of 17 at the Turner's Falls Rod and Gun club quickly followed by a further 5 at Barton Cove. By mid-morning both flocks had converged on Barton Cove while a brief check in the evening found seven birds present but included 3 first-cycle individuals not seen on the morning visit! So, an absolute minimum of 25 Bonaparte's Gulls passing through Barton Cove on April 12th. .
Overnight rain and warm southerlies brought yet more new arrivals on the 13th with some 55 Double-crested Cormorants between the Turner's Fall power canal and the Rod and Gun Club. New for the year was a Red-necked Grebe and a Spotted Sandpiper at Barton Cove (Josh Layfield), along with 4 Barn Swallows and a Bank Swallow at the Turner's Falls power canal. Scaup arrivals included 7 Lesser at the power canal, 7 Lesser at the Rod and Gun club and a further 7 Lesser joining the previously seen 5 Greater Scaup at Barton Cove. In the evening, 2 Black Vultures again appeared high over Barton Cove as they had done on the evening of the 11th. April 14th dawned mild and calm and I wasn't expecting too much in the way of grounded birds but I decided to check Barton Cove in any case. Initially, things seemed a little quiet and I couldn't find the previous day's Red-necked Grebe. In the distance a group of small group of 'gulls' resting on an exposed mud bar caught my attention. Instead of scoping them at range I drove around to Riverview Drive for a closer look and there sat with a few Herring and Ring-billed Gulls were 2 Caspian Terns. As I settled down to enjoy them, I could clearly hear the distinctive grating bark of one or more Caspian Terns in the air.......in fact there were 5 of them present together in the cove!! I last them heading towards Barton Campground at about 07:20 hours. Caspian Terns (5) - Barton Cove, Gill, Franklin Co., MA. April 14th, 2019. Louisiana Waterthrush - Gill, Franklin Co., MA. April 15th, 2019. There's nothing like the sweet cadence of a singing Louisiana Waterthrush to brighten up a chilly April morning. Even the haunting ethereal song of a nearby Hermit Thrush was no match for this beauty at a traditional spot in Gill today. In fact, this bird was along exactly the same stream as my first of the spring in each April since 2015! It's hard to imagine that it's the same male returning every year but if so, it's usually been about three days ahead of the first major influx. I expect the bulk will arrive in a few days time, around the 14th/15th, and pretty soon most of the fast flowing streams in the local Hemlock woods will be hosting a pair, or a singing male. On a more sobering note, I learned in the evening that Susannah had come across a freshly dead Northern Saw-whet Owl along Main Road, Gill close to the intersection with North Cross Road. I'm ashamed to say that I haven't put in any real work looking for saw-whets in this particular winter, but this bird was found only 200 meters from where I heard one calling unsolicited (pre-dawn) on October 22nd, 2018. Northern Saw-whet Owl - roadside casualty, Main Road, Gill, Franklin Co., MA. April 11th, 2019. Red Crossbills - Montague Plains, Franklin Co., MA. March 8th, 2019. As expected, March was characterized by the steady transition from winter to spring. The opening ten days of of the month remained cold with yet another winter storm depositing small amounts of accumulation on the 9th and 10th. Signs of spring were few but it was heart warming to find Red Crossbills nest building in the Montague Sand Plains on the 7th and the 8th. Red Crossbills tend to breed early and these were the first passerines of any kind that I had found nesting this year. They remained a personal highlight in the plains and I found them with remarkable consistency every time I visited with an estimate of about four pairs settling down for the breeding season, but not more than that. Red Crossbill (female) - nest building, Montague Plains, Franklin Co., MA. March 7th, 2019. Red Crossbill - female on nest, Montague Plains, Franklin Co., MA. March 8th, 2019. Here it's possible to just make out some of the white feathers that she used to line the cup of the nest. Red Crossbill (male) - Montague Plains, Franklin Co., MA. March 8th, 2019. Still in the Montague Plains, and almost equally impressive was the continued presence of 40 - 50 Common Redpolls throughout the month along with smaller numbers of American Goldfinches and Pine Siskins. Towards the end of the month they were joined by several 'waves' of returning Dark-eyed Juncos. For the most part, the Redpolls stayed high and busy in the Pitch Pines frustrating any serious attempts to search for Hoary Redpolls. While pale redpolls certainly existed within the flock, I couldn't find any decent candidates for Hoary Redpoll. Common Redpoll (male) - Montague Plains, Franklin Co., MA. March 8th, 2019. Common Redpoll - Montague Plains, Franklin Co., MA. March 8th, 2019. A little further afield, I finally caught up with a Northern Shrike in what appeared to be a fairly lean winter for the species, at least from a local perspective. But the traditional spot at Eugene Moran WMA produced one on the 3rd with an adult posing nicely for a short time before bolting all the way across to the opposite side of the WMA! Northern Shrike - Moran WMA, Windsor, Berkshire Co., MA. March 3rd, 2019. Horned Grebes (5) - Turner's Falls, Franklin Co., MA. April 9th, 2019. With yesterday's low cloud, drizzle and mist continuing through the night and into the morning, and coupled with a nice temperature drop, prospects looked good for more waterbird arrivals at Barton Cove. A brief but productive early morning spin around the cove didn't disappoint. The light was so poor around 06:45 hours that I held off from taking any photos until mid-morning but the initial haul included 2 Surf Scoter (pair), 8 Lesser Scaup, 6 Greater Scaup (5 male, 1 female), 3 Ruddy Duck (2 male, one quite bright), 4 Red-breasted Mergansers (1 male, 3 female), 3 Horned Grebe (2 in breeding plumage, 1 transitional), Snow Goose (white morph continuing since Apr 2nd), and a Double-crested Cormorant arriving mid-morning. I was most impressed with the breeding plumage Horned Grebes, a species which I tend to think of as being quite a scarce migrant through northern Franklin County. With that in mind I couldn't have been more thrilled to come across a further 5 Horned Grebes in a tight flock at the Turner's Falls Rod and Gun club. The latter site also yielded my first local Ospreys (2) of the year, plus there was a notable increase Tree Swallow, Pine Warbler and Chipping Sparrow numbers along the river this morning. Surf Scoter (pair) with Greater Scaup (6) at rear - Barton Cove, Gill, Franklin Co., MA. April 9th, 2019. Further indications of migration included 5 (3, 2) Great Blue Herons heading north high over Turner's Falls Airfield, a species I only occasionally detect on active migration in Franklin County. Great Blue Herons - Turner's Falls Airfield, Franklin Co., MA. April 9th, 2019. Three of five migrating high over the airfield this morning. By late afternoon, the weather had worsened bringing pulses of extremely heavy rain and cooler temperatures. A very quick check of Barton Cove found almost 200 newly arrived gulls including good numbers of adult/near adult Herring and Ring-billed Gulls. 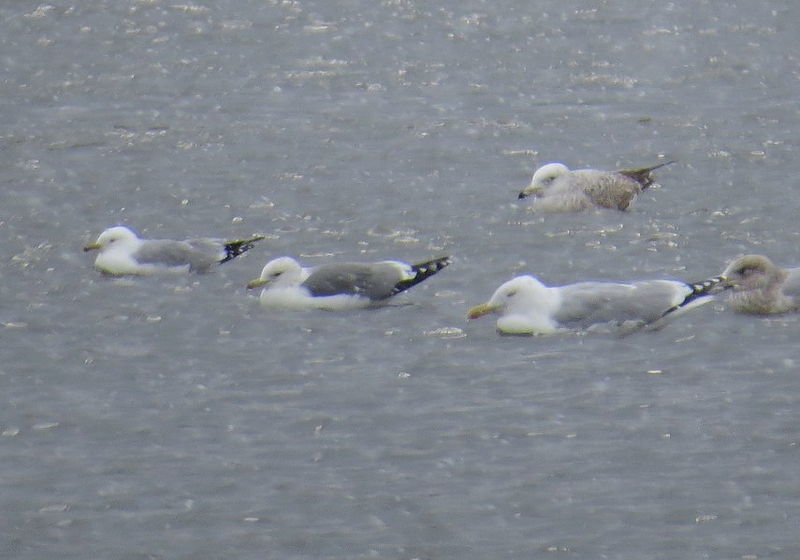 With them came a pristine adult/near adult Lesser Black-backed Gull. A tight flock of around 15 Double-crested Cormorants had clearly dropped in on the showers as well. Lesser Black-backed Gull (adult/near adult) - Barton Cove, Gill, Franklin Co., MA. April 9th, 2019. Just left of center with Herring and Ring-billed Gulls. 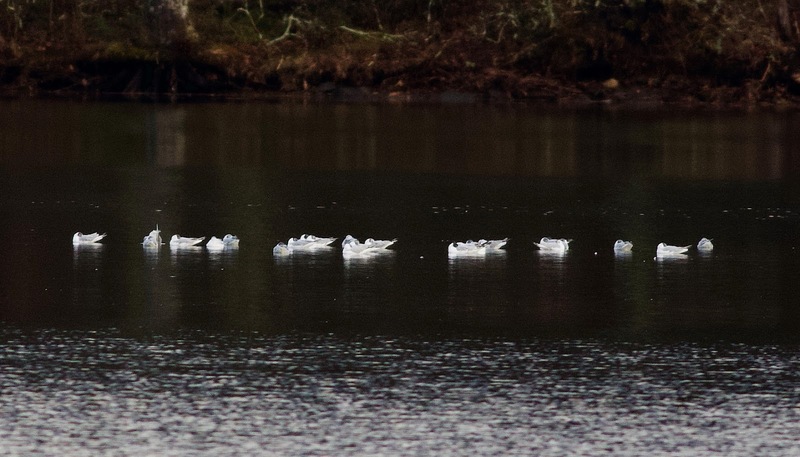 Bonaparte's Gulls - Barton Cove, Gill, Franklin Co., MA. April 9th, 2019. Image appears courtesy of Josh Layfield. Part of the flock of 29 initially found by David Sibley. And the day turned out to be far from over when David Sibley found 29 Bonaparte's Gulls and 10 Red-breasted Mergansers at Barton Cove off Riverview Drive just 70 minutes after I had to leave the area. As if that wasn't enough, David (along with Josh Layfield and Eric Huston) finished off the evening with a calling Caspian Tern flying upriver at dusk! Although April is the best month in the year to see Caspian Tern in Franklin County, it's usually the second half of the month when they show up and today's observation is the earliest that I'm aware of. Tundra Swan - from a flock of 19, Turner's Falls power canal, Franklin Co., MA. March 11th, 2019. A fine drake Canvasback showed up at the Turner's Falls power canal on the 3rd (Scott Surner) and remained until the 7th at least. 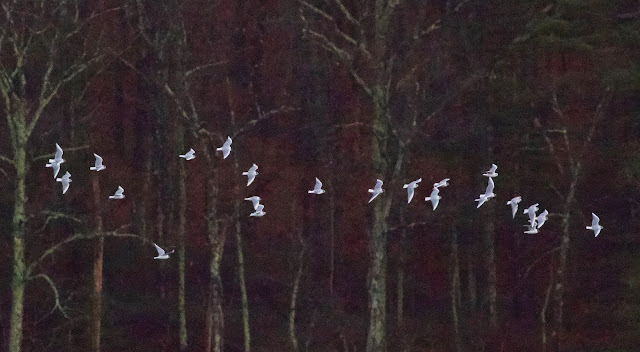 It turned out to be the harbinger of a steady but varied waterfowl migration through the Turner's Falls area and Franklin County in general, a migration spearheaded by the sudden and dramatic appearance of 19 Tundra Swans at the power canal on the 11th (Alex Haro/Josh Layfield). The swans were courteous enough to remain through the 12th allowing tens of birders to catch up with an impressive state rarity. The middle of the month saw Canada Goose numbers swell considerably with impressive four figure concentrations being variously reported from Sunderland, Deerfield, Gill and Turner's Falls through to the month's end. With them, though often difficult to pick out, 1 - 3 Cackling Geese fairly regularly among the masses and 36 Snow Geese in Sunderland on the 15th (Al Richards). A fine adult Greater White-fronted Goose joined the flocks of geese collecting in Barton Cove on the 23rd (Scott Surner) and remained through to the 25th, and a lone Snow Goose turned up on the 30th (Josh Layfield) with probably the same bird continuing well into April. In addition, Josh Layfield detected an oddly Snow Goose-like hybrid which mysteriously appeared at Barton Cove on the 23rd, became somewhat aloof and then disappeared just as mysteriously only a few days later. Most domestic-type hybrids tend stick around for months in Barton Cove so the sudden departure of this bird came as a bit of a surprise. Hybrid Goose - Barton Cove, Gill, Franklin Co., MA. March 23rd, 2019. Found and photographed by Josh Layfield. Canvasback (male) - Turner's Falls power canal, Franklin Co., MA. March 7th, 2019. Cackling Goose (left) - Barton Cove, Gill, Franklin Co., MA. March 23rd, 2019. Cackling Goose (center) - Barton Cove, Gill, Franklin Co., MA. March 25th, 2019. Greater White-fronted Goose (adult) - Barton Cove, Gill, Franklin Co., MA. March 23rd, 2019. The annual spring build-up of Ring-necked Ducks peaked (c.140) towards the end of the month rolling into early April. The flock followed the ever receding ice at Barton Cove and could often be found very close into Riverview Drive in Gill. Lesser Scaup were often present with 3 males together at times and a nice male Greater Scaup offering 'great' comparisons on the 26th. Impressive concentrations of Common Mergansers could also be seen on Barton Cove in the last days of the month along with Common Goldeneyes, and a handful of Hooded Mergansers and Buffleheads. Iceland (Kumlien's) Gull (center) - probably 3rd-cycle, Barton Cove, Gill, Franklin Co., MA. March 25th, 2019. The second half of March saw a fabulous migration of large gulls through Turner's Falls and Barton Cove though numbers did taper sharply towards the month's end. Without doubt the find of the month was an adult/near adult California Gull carefully studied by David Sibley at the Turner's Falls power canal on the 17th. 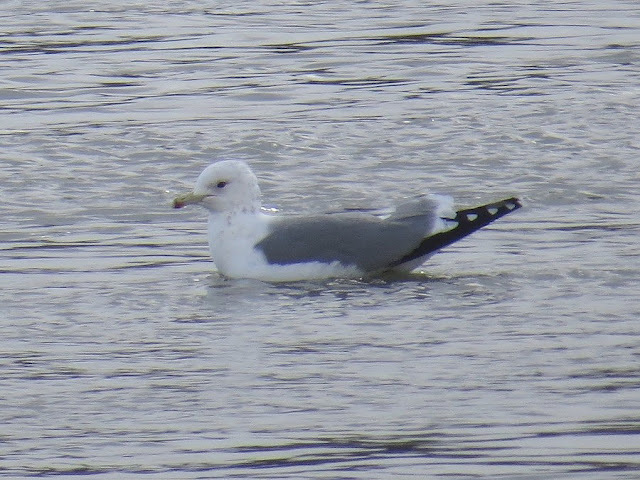 It was found on a quiet Sunday morning with very few other gulls present and departed NW with a couple Herring Gulls never to be relocated. As with any state level rarity, the record will have to be ratified by the Massachusetts Avian Records Committee but does look set to become the 6th state record and the first ever in interior Massachusetts - what a find! California Gull - adult/near adult, Turner's Falls power canal, Franklin Co., MA. March 17th, 2019. Image appears courtesy of David Sibley. California Gull (center) - adult/near adult at rest with Ring-billed and Herring Gulls, Turner's Falls power canal, Franklin Co., MA. March 17th, 2019. The last ten days of the month also saw a good nice 'wave' of Lesser Black-backed Gulls with birds frequently found amid the masses on the ice at Barton Cove. At least four birds were involved with two adults, one 3rd-cycle and one 2nd-cycle. Lesser Black-backed Gulls (adults) - Barton Cove, Gill, Franklin Co., MA. March 24th, 2019. Iceland Gulls were few and far between but David Sibley did find a compelling example of a 2nd-cycle bird quite closely resembling L.g. thayeri rather than the expected L.g. kumlieni. The image set is still being studied but at this stage it's looking quite difficult to rule out an intergrade though perhaps pointing more towards Thayer's rather than Kumlien's. Either way, it was a really super bird to watch closely and a good one to learn from. Thayer's Gull or Thayer's/Kumlien's intergrade (center) - Barton Cove, Gill, Franklin Co., MA. March 24th, 2019. Found by David Sibley. All five flight images above show the same individual.